This easy, creamy Fish Stew recipe, has a sweet creaminess that kids will love. Based on a Brazilian style recipe, it’s a really healthy, tasty way to eat more fish. Please tell me it’s not just our family whose fish consumption is heavily based on fish and chips during seaside visits?! I know. I’m a food blogger and all that jazz, but for some reason I have a bit of a mental block about putting fish on our weekly meal plans. Did you know that the NHS recommend at least 2 portions a week?! I’ve sifted through my blog archives and thought I’d update and reshare some older recipes for inspiration. I forgot how surprisingly yum this Fish Stew recipe is. It’s simple and quick to make. You can use frozen cod if you like = easy and good value for money. This fish stew has potatoes in so it’s a one pot meal (unless you like double carbs and add rice on the side as I do – CARBS 4 LYF). What is in fish stew? A stew is usually, some kind of protein and vegetables, cooked in broth or gravy on the hob. 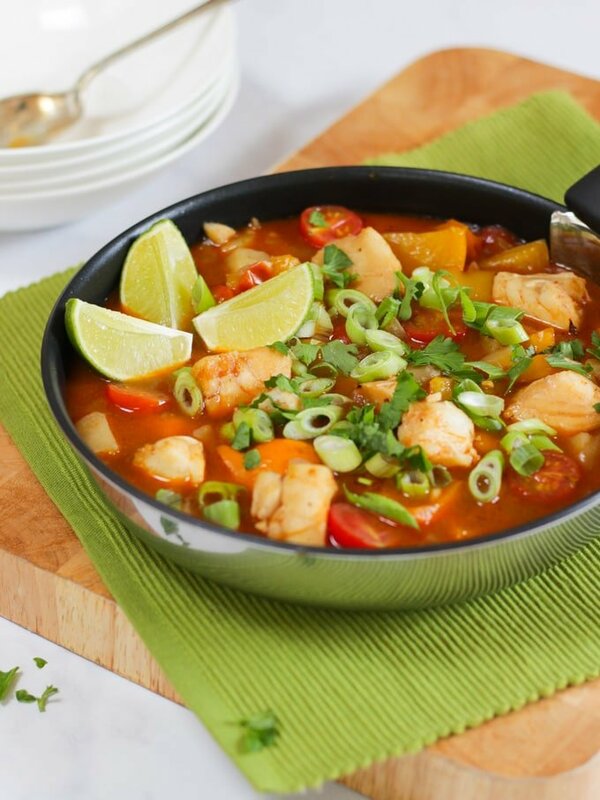 This fish stew recipe uses cod, but you could substitute in other firm fish if you prefer. You could also add shellfish, (just be sure to not overcook, add just at the end of cooking). 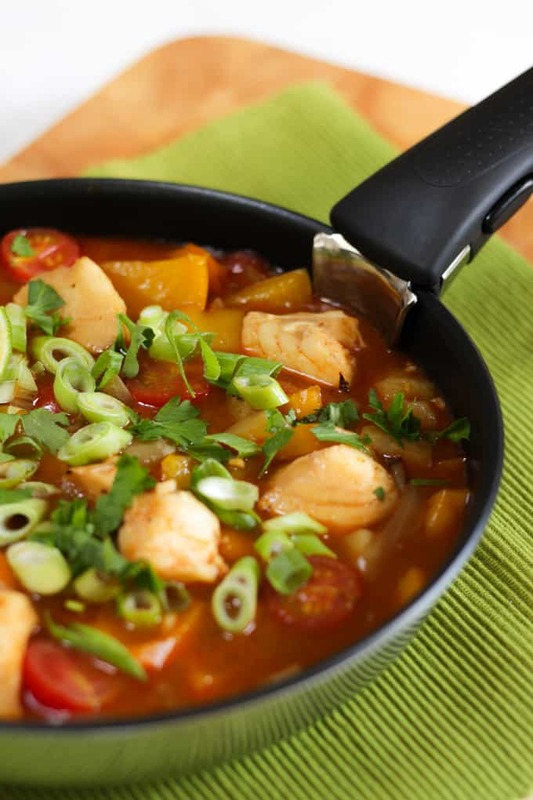 This recipe is a family friendly take on the Brazilian fish stew called Moqueca. It uses paprika, tomatoes, peppers and coconut milk to give a delicious creamy tasty stew base. It also include potatoes, making this a full meal in one pan – winner! How do you make fish stew? 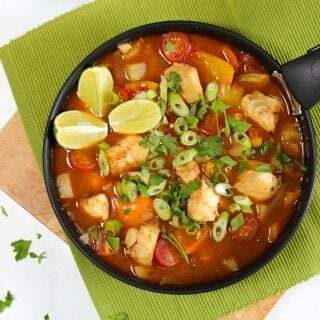 To make this Brazilian style Fish Stew recipe you start by frying off some of the vegetables with olive oil; garlic, onions, potatoes and peppers. Then adding the flavourings; paprika and a touch of chilli, before putting in your cubes of cod, coconut milk and cherry tomatoes. Be sure to cut the potatoes into bitesized cubes otherwise they will take too long to cook and the fish will be overcooked. You can use tinned tomatoes rather than fresh, cherry tomatoes if it’s easier. The fresh tomatoes do give a lovely acidity but sometimes ease wins. This recipe for fish stew is also really low calorie at only 328 calories a portion if you don’t add any other side dishes, like rice. 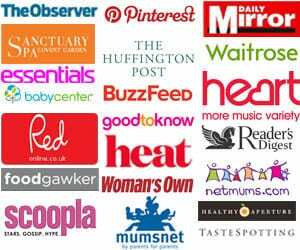 If you’re following the Slimming World plan, you can use Frylight instead of oil, and count the syns for the Coconut Milk. Omit the chilli if you like, although I find that a small pinch gives just a touch of warmth without offending my children. I hope you enjoy the family friendly fish stew recipe if you try it home. Let me know if the covert ‘Traffic Light Soup’ technique works for you to get them eating! Fancy some more simple fish recipes? How about my Sweet Potato Fish Pie with Salmon or Easy Homemade Fish Fingers ? 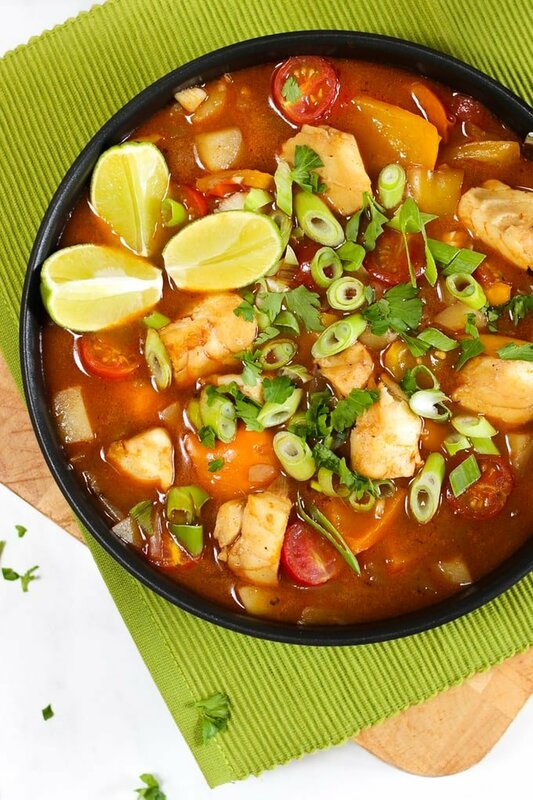 I’d love to know how you got on and what you thought of it if you make this Fish Stew recipe. Please rate the recipe and leave me a comment below if you do. This easy, creamy Fish Stew recipe, has a sweet creaminess that kids will love. Based on a Brazilian style recipe, it's a really tasty way to eat more fish. Heat the oil in a pan and add the garlic and onion. Fry for 5 minutes or until soft. Add the potatoes, peppers, paprika and a sprinkling of chilli if using and cook for 10 minutes until softened. Gently add the cod pieces and pour over the coconut milk. Sprinkle the cherry tomatoes in. Add salt and pepper and pop the lid on and leave to bubble away for about 15 minutes or until the fish is cooked through and the potatoes are soft. Serve with wedges of lime, slices of spring onion and coriander. This looks amazing and we love seafood in our house. And as it’s a one pan dinner even better! Thanks so much for sharing. Will definitely be trying this.